Josh Eichorn: discovered, much to his dismay, that just because he’s been drinking– it doesn’t mean he can river-dance. She-Dragon arrives at the home of Dragon but as she rings the doorbell, the house’s new security devices violently restrain her. Rex Dexter apologizes and deactivates his equipment and Dragon suggests that perhaps it needs some work, allowing it to tell apart friend from foe. She-Dragon is helped to her feet before being welcomed inside. The heroine had come to see Dragon in the hope of replacing his wife on the Liberty League. The sight of She-Dragon concerns Mister Glum as he had not considered having to deal with another Dragon. He confronts Angel about keeping such details from him but she laughs off his worries, pointing out that if he really wants to conquer the Earth then he should do just that. Anyone that opposes him could be dealt with if and when they challenge him. The heroes head into the basement where Rex has been identifying the biggest threats to the world so that they can be prioritized and dealt with. He does not believe that Dragon will be able to resolve these problems on his own, especially as the touch from Negate does seem to be weakening him albeit very slowly. 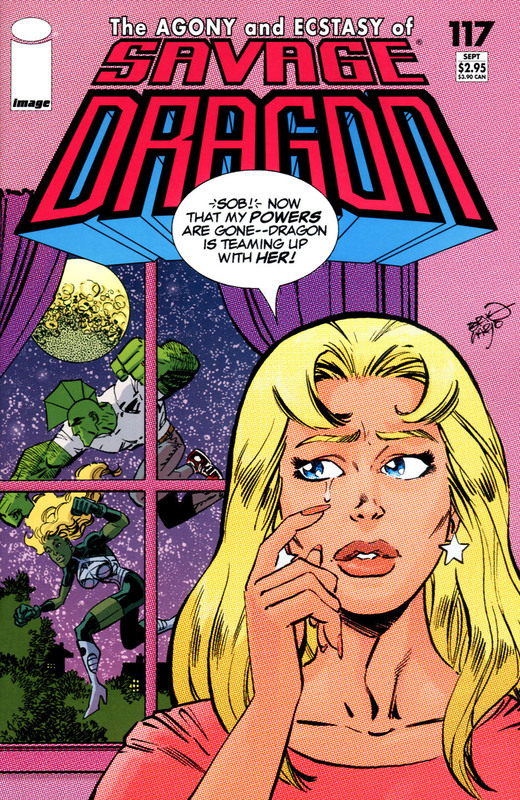 Jennifer Dragon thinks that it is probably for the best that she lost her powers as she cannot think of anything good that she accomplished, focusing only on the bad things such as killing her first husband, Deathseed and the Brain-Child. A number of methods of attaining superhuman abilities are listed by She-Dragon that includes the Creator, the Power Broker, Radiation Island and even some of Chicago’s water supplies. Rex is confident that he could create something to help Jennifer should she wish it as he did create the Battle Tank armor so something similar should not be too difficult. Rex has also replaced Dragon’s lost flying car by augmenting his Chevy. 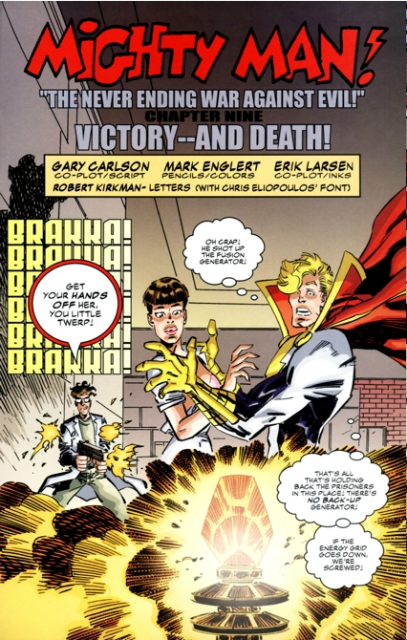 She-Dragon is taken aback by Rex’s mutations which leads Jennifer to detail how exposure to something from Dimension-X altered his appearance. She is convinced that Rex could be becoming the next Deathseed but her husband is ignoring her warnings. Jennifer also runs down the numerous enemies that seem to be after them. Dragon interrupts to say that something has come up and he would like Jennifer to contact Alex Wilde for him to help out. Jennifer refuses to call Alex due to what happened the last time he accompanied Dragon and She-Dragon seizes the opportunity for herself. Dragon and She-Dragon head into the city where Weed has declared war on humanity, hoping to claim the planet for sentient plants like him. He wishes to remove the threat of mankind before global warming and other man-made environmental dangers escalate further. Dragon understands his motives and even agrees with some of his goals but points out to Weed that there are better ways for him to express his opinions. As the enemies seem to be coming to an understanding, She-Dragon ruins things by using a flame thrower on Weed, sending him off vowing revenge. Later that evening, Dragon informs his wife that She-Dragon will not work out as she is completely incompetent. He puts on the news and is shocked to see an advertisement for Dragon/Urass, candidates for the next election. Dragon has no idea why someone has put his name forward to become the next President of the United States. He has finally grown too frustrated to deal with anything else and heads off to bed for the night. She-Dragon settles into bed in one of Dragon’s guest rooms but hears a noise and goes out to investigate. She finds Mister Glum emerging from Dragon’s bedroom with a weapon in hand and chases him down towards the basement. Glum had considered using the God Gun to finally eliminate Dragon but decided that it would have been a waste of his wish. He deposits She-Dragon into Dimension-X before throwing all of her belongings in after her. The next morning when the Dragon family look into She-Dragon’s disappearance, Glum merely informs them that she had to leave.